Turkish Prime Minister Ahmed Davutoglu said on Monday Ankara will not allow the town of Azaz in northern Syria to fall to the Kurdish YPG forces and promised the "harshest reaction," if the group attempts to re-take the city. 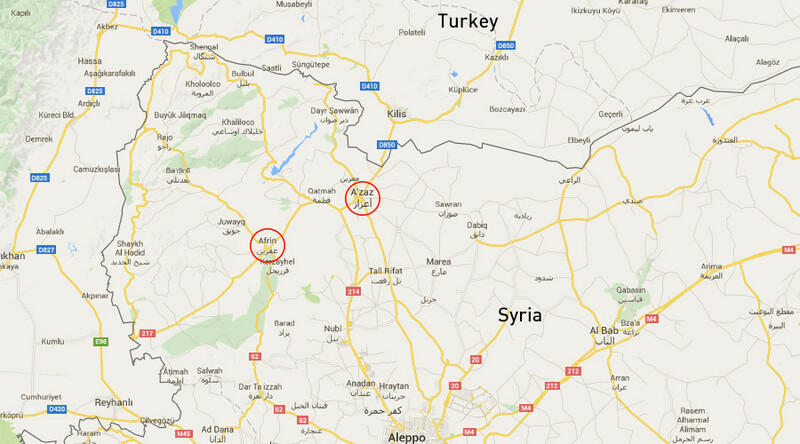 "YPG elements were forced away from around Azaz. If they approach again they will see the harshest reaction. We will not allow Azaz to fall," Davutoglu told reporters aboard his plane bound for Ukraine, Reuters reported. He said the Turkish military would render Syria’s Menagh air base "unusable" if YPG forces do not retreat from the area, which they previously captured from Islamist militants. He warned the YPG not to move east of its Afrin region or west of the Euphrates River. Turkish security forces hit Kurdish militia targets in Syria for the third day in a row Monday. A Turkish Foreign Ministry spokesman said the strikes came after a border security outpost was attacked in the morning. "Today our border security outpost in the Hatay area at the Syrian border was attacked. Retaliation shots were fired in return," spokesman Tanju Bilgic told reporters. News has also come in that missiles hit a children’s hospital, a school and other locations in Azaz, killing more than 14 people, according to a medic and two residents who were cited by Reuters. Speaking at a press conference in Kiev, Ukraine, Davutoglu claimed that a “Russian ballistic missile launched from the Caspian Sea” hit both the school and the hospital. Meanwhile, a Turkish security official speaking with Reuters said seven Russian missiles struck a hospital. The Russian Foreign Ministry said in a statement on Monday that Turkish strikes on Syrian territory breach the UN Security Council’s resolution, and called on Ankara to cease immediately the ongoing "military provocations." “Starting February 13, Turkish artillery amassed on the border with Syria is hitting on a massive scale the Syrian residential areas recently freed from the terrorists by government and Kurdish forces,” the Russian Foreign Ministry’s statement said. "There are multiple reports of people killed and injured among the civilians; the infrastructure and residential buildings have been destroyed." "In the meantime, according to incoming information, the Turkish side continues to indulge an unlawful infiltration of fresh armed jihadi and mercenary groups into Syria, set to reinforce Jabhat Al-Nusra, Islamic State and other terrorist groups’ units who suffered casualties in the battle." Kurdish YPG militia and moderate units of the Free Syrian Army re-took the town of Azaz earlier in February, previously held by Al-Nusra Front militants. On Saturday, the Turkish Army launched a massive shelling attack on Kurdish targets near the city of Azaz in northwest Syria, including an air base recently retaken from Islamist rebels. 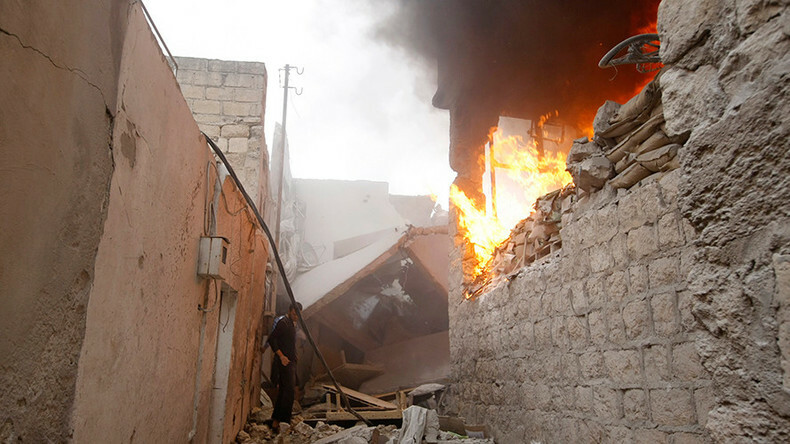 It also hit Syrian forces across the border, according to media reports. Speaking on Saturday, Turkish Prime Minister Ahmet Davutoglu threatened Syrian Kurds with military action, saying that if there is a threat to Turkey, “we will strike the PYD [Kurdish Democratic Union Party] like we did Qandil,” referring to a violent bombing campaign waged by Turkey against the PKK (Kurdistan Workers’ Party) in its Qandil mountain stronghold in northern Iraq. Later in the day, the Syrian government sent an official letter to the UN, strongly condemning Turkish actions and describing it as supporting terrorist groups. “In addition, Turkish artillery bombarded the towns of Maraanaz, al-Malikiyah, Minagh, Ain Dakna and Bazi Bagh, which are home to the civilian population,” the complaint addressed to the UN Secretary General and the UN Security Council said. The letter added that 12 trucks mounted with heavy machine guns and carrying around 100 fighters entered Syrian territory from Turkey through the Bab al-Salam checkpoint on Saturday. The claim was later denied by the Turkish government. Washington and Paris have called on Turkey to cease its massive artillery bombardment against Kurdish targets and de-escalate tensions on all sides. Referring to comments from US State Department spokesman John Kirby, Turkish Foreign Ministry spokesman Tanju Bilgic said Ankara is "shocked" by remarks from Washington that put Turkey in the same basket as the Kurdish YPG group. Kirby urged both Turkey and the Syrian Kurds to focus on tackling a "common threat" from Islamic State militants. Bilgic added Turkey will not seek permission to fight against "any terrorist organizations." The French Foreign Ministry also urged Turkey to halt the artillery strikes on Kurdish areas in Syria. "France is worried about the deteriorating situation in the region of Aleppo and the north of Syria. We call for the cessation of all bombardments, those of the regime and its allies on the entire territory and those of Turkey in the Kurdish zones," Paris said in a statement.